Welcome back to the Grand City of Middelburg, a vast metropolis that is home to over a million souls… and one hellish demon. Once the most prosperous and bustling city on the continent’s east coast, it is now the haven of fear, distrust, grief and death. It has been six month since the hellion that stalks the night began its reign of terror, butchering its victims in the most cruel and inhuman ways, and the city bleeds like an injured doe. You have survived thus far in the Ruined City, but as your comrades leave this world through the Ruined Man’s mad machinations, you wonder for how long. The city has now become his and its citizens his fearful vassals. Can you survive the chaos all around you? Can you survive as brother turns upon brother in desperation and paranoia? Can you survive when friends betrays friend and parents murder their children for a scrap of food? Can you survive the Ruined People? The Ruined People is the second book in the Ruined Saga and comes with four fresh missions that will make your players prove their worth on the streets of Middelburg or die trying. The missions are each unique and will cover a great many themes, from burglary, breaking and entering to protections missions and being on either side of an ambush. But it is not just the story the players see that are vital to the campaign; but the story underneath it all, present at all time throughout the missions but invisible unless you know what to look for: the story of the Ruined Man. The players now know who the villain of the story is, but now yet the “whys” and “hows” and that is what each clue in each mission will tell them, if they can find it. And if all that isn’t enough of a challenge for the players, then remind them that the longer the campaign goes on for, the more difficult travel becomes in the city and more closed down its people become. The city and people themselves will be working against them. The Ruined People is not just a campaign book. As with the previous book, the Ruined People serves as a primer for exploring Middelburg as well. Alongside each mission is a lore based chapeter detailing a district or two of the city as well as its places of interest before the mission attached to it will let your explore that district and see firsthand what the city looks and feels like; and in and around the missions of the campaign these lore chapters will give you more than enough information to craft your missions, adventures and campaigns in the city by drawing on the histoy and culture of these districts. In The Ruined People, you will find four of these lore based chapters covering nine new districts of Middelburg, chronicling over forty unique locations to explore. 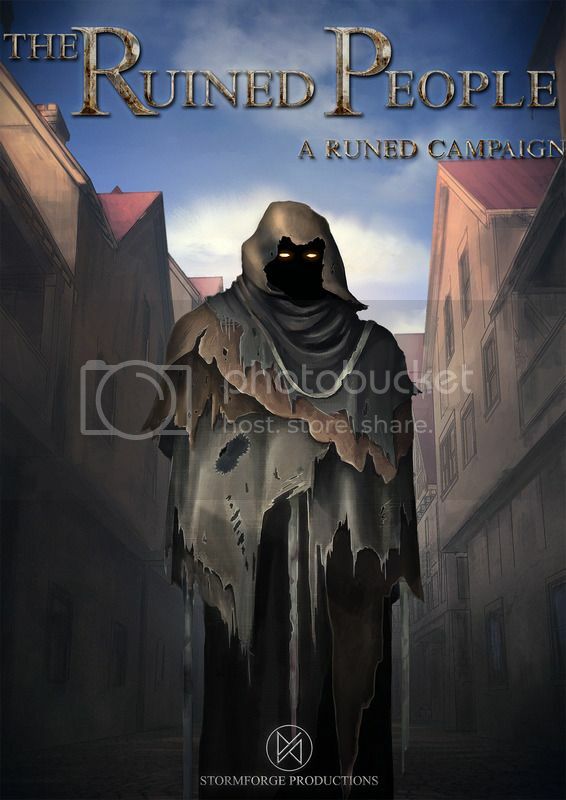 The Ruined People is a campaign for The Runed Age and therefore the Runed Age Corebook is required for play. Other than that, The Ruined People will provide everything else you need; all the NPCs and all their equipment, skills and runic arrays are provided in the book so you can just pick up and play. Not caught up yet, get the first campaign book “The Ruined City”, the first mission is free to try!